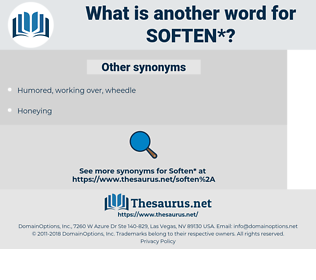 What is another word for soften? mitigate, Mitigating, lessen, soothe, loosen, attenuate, relieve, cushion, reduce, reducing, dampen, assuage, ameliorate, minimize, defuse, diminish, moderate, temper, allay, dilute, smooth, offset, liberalize, absorb, de-escalate, shorten, streamline, decrease, slow, minimise, curb. alleviate, sweeten, ease, lighten, relax, weaken. enlarge, magnify, grow, heighten, worry, increase, upset, raise, compliment, aggravate, intensify, incite, worsen, praise, coagulate, disturb, excite, irritate, withhold, trouble, prolong, agitate, provoke, rise, extend, strengthen, solidify. embitter, enhance, recruit, beef, vitalize, energize, rejuvenate, invigorate, augment. I will sit on a stile and continue to smile Till I soften the heart of this cow. Then the game is not lost; be guided by me, and you shall marry Amy, and some day we will talk and chat over these troubles, which time will soften, and they will not be so horrible then. 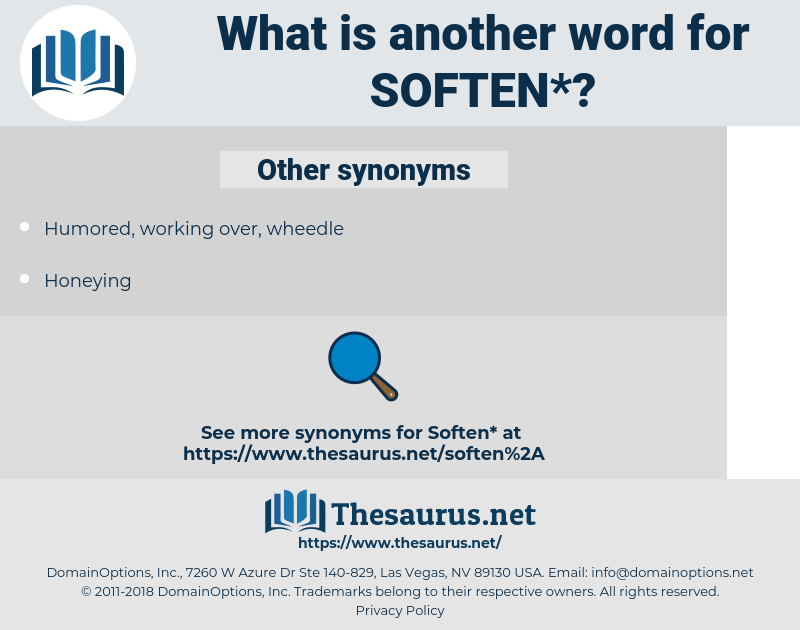 spodumene, shahaptian, spittoon, skip town, soviet union, sputum, sahaptino, Sabbatum, sea captain, speed demon, spotted hyena, sabaton, sahaptin, sea bottom, septum, soft on, septation, seif dune, soft money. dampen, mollify, mellow, damp, deafen, macerate, deaden. dampen, tone down, muffle, damp, mute, dull. alter, blunt, modify, deaden, change.